"The Barbados Cricket Association was under the management of the white "planter-merchant" wealthy elite... and included clubs such as Wanderers...which had been founded on racial grounds and remained selective on the grounds of colour until such discrimination was prohibited by law after 1957" . Holder scored his maiden Test century a couple of weeks ago in Antigua but had a nasty fall when bowling at Greneda and seemed a doubt for tomorrow's Test match. I asked him if he'll play - I think he will. He is a modest, impressive young man. Massively tall andhighly articulate I think a future West Indies captain. 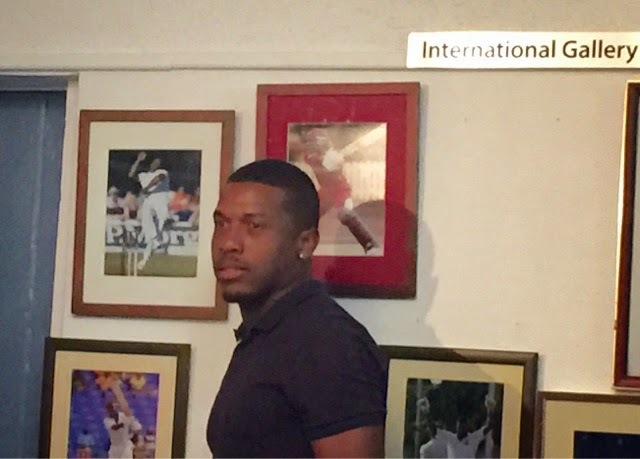 Another Test-playing young graduate of Wanderers was also present - Chris Jordan. And that is quite a story! I spoke to many people who helped Jordan was he was a promising young cricketer and later when he had a full season with Wanderers. At 15 Jordan was offered a place at Dulwich College where under Bill Athey's coaching he progressed swiftly. He is now, of course, in the England team. Chris despite some British roots on his grandmother's side is a Bajan. 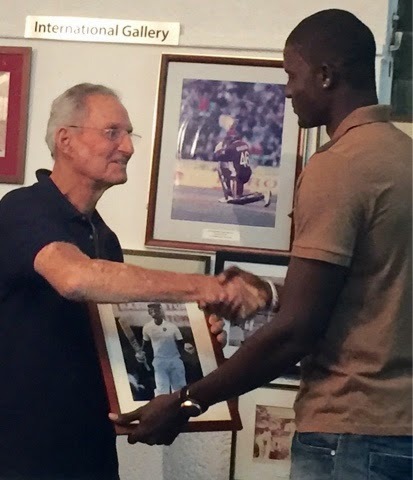 And he was clearly proud to be back at Wanderers and to receive an award alongside Jason Holder. I spoke to many at the Club about Jordan's decision to qualify and play for England rather than the West Indies. Nobody was critical, and pride was the dominant position they took. The people of Barbados love their country, and support the Windies. But when one of them plays not for the country of his birth and parentage it doesnt seem to bother them one bit! Wanderers today is the best of cricket. Enthusiastic, volunteer led and of course completely undiscriminatory. That said I was told that the younger white Bajans joining the Club prefer to play football rather than cricket. If this is typical across the island and across the West Indies it may explain why hardly any white West Indians have made it to representative level for a long time.